We develop first-principles computational methods and programs and extend them toward multi-scale simulation. To solve practical issues, we try to establish the best scheme and, where appropriate, utilize digital-data-driven methods. We have been developing a first-principles computational code "QMAS" based on the density-functional theory (DFT) using plane wave basis sets and the projector augmented-wave (PAW) method and applying it to various problems in the materials science field. Recently, we focus on computational features such as maximally-localized Wannier orbitals, two-component spinor formalism and electron-positron two-component DFT. Figure represents maximally-localized Wannier orbitals constructed from the electronic states contributing the spontaneous polarization. λ=0 and λ=1 correspond to the paraelectric and ferroelectric phases, respectively. To understand properties of molten salts and electrolytes in batteries, it is very important clarify the ionic conduction mechanism. To simulate realistic systems, large-scale and long-period calculations are required, and we have been developing novel computational techniques. 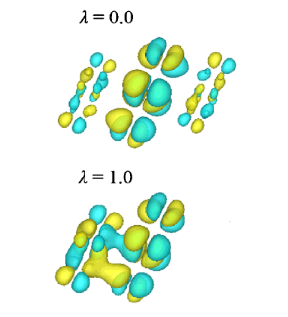 Figure represents a snapshot in simulation on Mg(BH4)1.6(AlH4)0.4. We performed first-principles molecular dynamics calculations on the high-temperature phase of Mg(BH4)2 and found that mobility of Mg2+ ions is dramatically enhanced when a part of anions by substituting AlH4- for part of anions. In order to apply quantum chemical calculations to large systems for improving materials properties and/or exploring new features, we have been developing the fragment molecular orbital (FMO) method and related computational techniques. It is expected that ten to a hundred times large molecules can be handled compared to standard computational techniques. We apply this method to clarify dominant factors in realistic phenomena. Recently, we have developed a two-stage parallelization scheme for QM/MM calculations and accomplished faster replica-exchange dynamics. As an application, we investigated isomerization reactions in solvent for H2O2 by 2 ns molecular dynamics calculations. Since novel high-performance magnets and transition-metal compounds are attracting much attention, we have been developing computational techniques to deal with "correlated" materials and applying them to practical issues. Recently, in order to find novel materials, we try to establish a proper scheme to deal with non-uniformity as well as to increase accuracy. 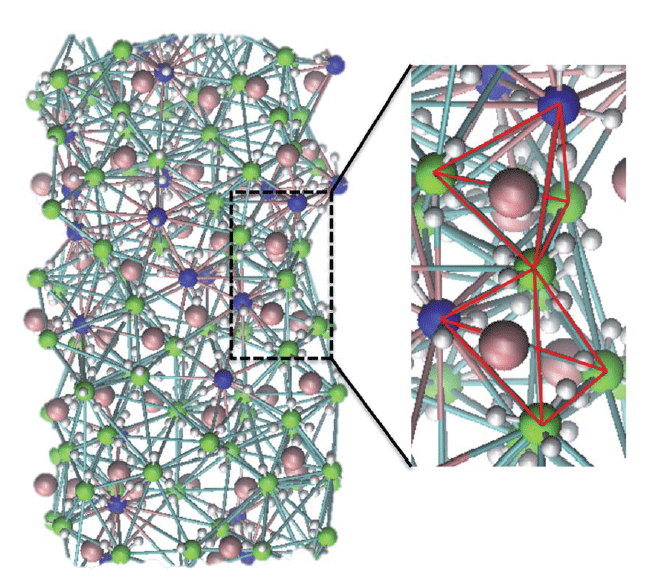 Figure represents the crystal structure of a permanent magnet compound NdFe12N. 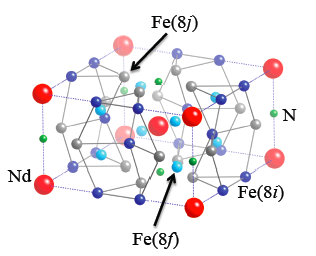 We investigated, by first-principles calculations, Ti-substitution effects (To stabilize the crystal structure, a part of Fe atoms are substituted by Ti) and the mechanism of magnetic anisotropy enhancement by N introduction.